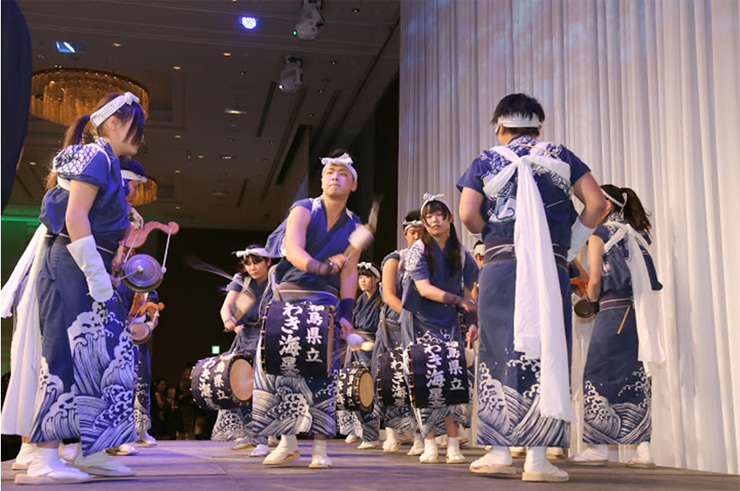 TOKYO, Feb 23 (KUNA) -- The Kuwaiti Embassy in Tokyo held a large reception on Monday evening to mark the anniversary of of Kuwait's 55th National Day and 25th Liberation Day, which brought some 900 guests in an atmosphere of happiness and harmony. Minister for Disaster Management Taro Kono, Parliamentary Vice-Minister for Foreign Affairs Miki Yamada and other high-ranking officials, political and military figures, businessmen, academics, diplomats and media figures as well as representatives of the Japan-Kuwait Society attended the ceremony. In her speech at the reception, Yamada offered sincere gratitude for the heart-warming support by Kuwait in response to the 9.0-magnitude earthquake-tsunami disaster in northeastern region in March 2011. Among financial aid from Kuwait following the tragedy, she shed light on the opening of a brand new outdoor exhibition facility last July at tsunami-damaged Aquamarine Fukushima, which is widely loved by the people of the northeastern region. 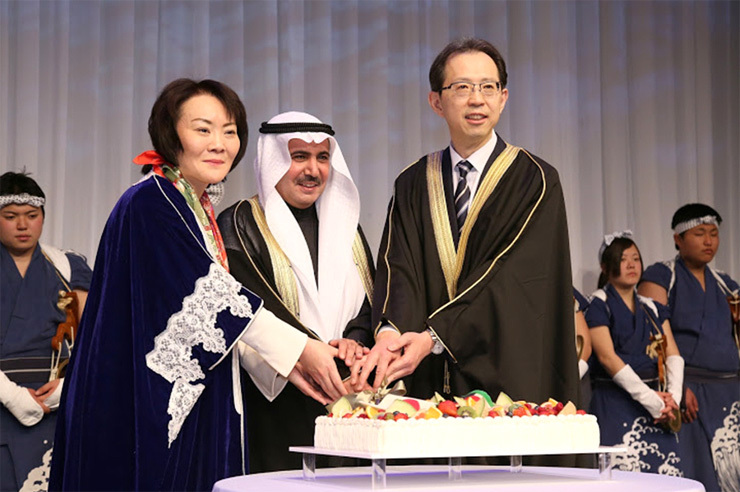 "Moreover, I saw the news about the foundation of the "Kuwait Partnership Fund for Medical Education" in Miyagi Prefecture this February making use of generous assistance by Kuwait," she said. "These are just a few examples that illustrate the fact that the assistance extended has shone bright light into the future of the reconstruction in the afflicted areas. I am firmly confirmed that this would be passed on from generation to generation as a token of friendship between the two countries," the official added. Yamada also underlined the historical visit to Japan by H.H. the Amir Sheikh Sabah Al-Ahmad Al-Jaber Al-Sabah in 2012, which was followed by Japanese Prime Minister Shinzo Abe's visit to Kuwait in 2013, during which Japan and Kuwait determined to deepen the bilateral relationships to a comprehensive partnership. 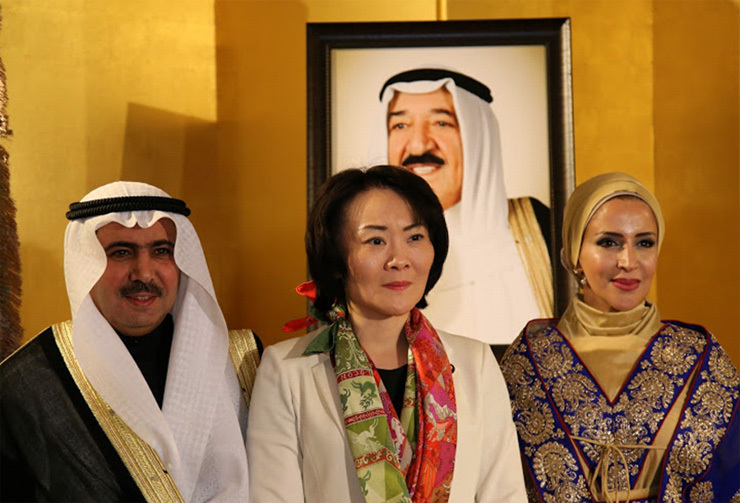 "Since then, we see a steady progress in various fields such as politics, economy and culture, through mutual visits of the high-rank officials and various people-to-people exchanges at both public and private levels," she said, pledging that the Japanese government will make every effort to further develop the relations between Japan and Kuwait. Governor of Fukushima Prefecture Masao Uchibori said the prefecture has been stepping forward to revive. "The people of Kuwait have given us a lot of warm support since immediately after the disaster and strongly backed the revitalization process. I am strongly encouraged by Ambassador Al-Otaibi's remark that Fukushima is his true friend, and his visits to the prefecture," said Uchibori. "I would heartily like to express my gratitude on behalf of all citizens in Fukushima Prefecture once again." For his part, Kuwaiti Ambassador to Japan Abdulrahman Al-Otaibi commend the great efforts that disaster-stricken prefectures and the Japanese government have been making to overcome the catastrophe. "I reiterate Kuwait's support to these efforts, building on the strong relations between our countries and peoples," the ambassador said. He also highlighted Kuwait's remarkable contributions through international organizations and specialized agencies in addition to the assistances that Kuwait Fund for Economic Development has been providing since its establishment in 1961 to alleviate humanitarian sufferings anywhere around the world. Working time will be changed during Ramadan. Working time and holiday will be changed during Ramadan.